I returned to London late last week for the first time since I left and moved back to San Francisco in 2006. What a fun trip down memory lane: Marylebone, the Wallace Collection, the British Museum (saw the famed crystal skull of Indy Jones lore — quite disappointing in fact), park after park after park… I love that city, at least for visiting, even if I’m not constituted to live there long-term. I had some business meetings too, and went to the stunning new Allen & Overy offices. Beautiful! They have masterfully built an all-glass structure immediately on top of and around the old market at Bishops Square, and turned the entire surrounding area into a delightful pedestrian area. In my opinion this is about as good as it gets, at least for a law firm (in which one is likely to spend long hours, you might as well have amenities like A&O does). Took a true deja-vu excursion to the Tate Modern rooftop cafe for the view and late-Friday-night drinks, followed by the best tapas I have ever had under a railway bridge near Waterloo. Seriously; it’s called Mar I Terra. 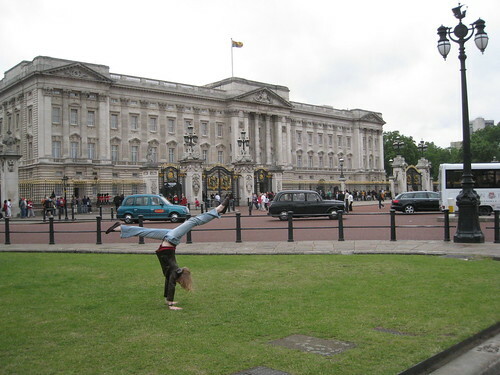 All of this occurred after I’d taken care of a key priority: a handstand in front of Buckingham Palace.